At some point last night, I tweeted that sudden death of Game 7 in hockey was like chain-smoking cigarettes while doing cocaine bumps and sitting on the Lethal Weapon 2 toilet. I have only done one of those three things. I was just guessing. But playoff hockey is a different animal, and when your entire season hinges on a series of bounces, rebounds and deflections that just keep coming and coming, the experience ceases to be entertaining and morphs into something much darker. You don’t watch sudden death of a Game 7; you endure it. There’s just nothing like it. and then, it comes down to hustle and luck. Last night’s hasty overtime came down to two rebounds: Boston’s Patrice Bergeron missing his chance because of a bouncing puck, then Washington’s Joel Ward coming through two minutes later. That’s hockey for you. Boston had a slightly better team; Washington had a slightly better goalie. It was a coin flip. Ahhhhhhh, the goalies. Last spring, Boston’s Tim Thomas was lights-out. This spring, he left the lights on two or three times a game. Even if neither of Wednesday night’s goals were his fault, he played just poorly enough in the other games to keep the Caps hanging around. As the years pass and memories cloud, people will remember Thomas’s goofy White House snub in late January serving as a tipping point of sorts — in other words, the Bruins were heading for a repeat until Thomas screwed up the whole thing. and looking back, maybe that they barely eked out a 4-2 victory (capped off by a late empty-netter) wasn’t the greatest sign. Just don’t blame the White House (and the admittedly kooky Washington symmetry) for Boston’s season inadvertently peaking in December. Blame Nathan Horton’s season-ending concussion on January 22 — from that point on, Boston’s offense just never felt as potent. Blame the upper-body injury that claimed reliable defenseman Adam McQuaid for Round 1, which meant Greg Zanon and Joe Corvo played more than anyone wanted. Blame Bergeron’s mystery injury from Game 5, which clearly hampered him in the final two games (and maybe caused him to blow that overtime rebound). Blame backup Tuukka Rask’s knee injury putting the season’s weight entirely on Thomas (38 years old, by the way). Blame Washington rookie Braden Holtby for harkening the ghost of Steve Penney for two solid weeks. Blame Boston’s lousy power play, which disappeared even more egregiously than it did last spring (when it nearly cost them the title). Most of all, blame hockey. This is what happens with defending champs: They kill themselves to win a Cup, celebrate all summer, let down a little, regroup, prove they’re great again, and then, it’s really up to the whims of the season itself. Sometimes they go your way, sometimes they don’t. Quick story: I attended 22 Kings games (and counting) this season and sat directly behind one of the nets. Almost immediately, I found myself becoming fascinated by the quirkiness of goalies. There’s something extremely OCD-ish about that position; it’s all about sticking to a semi-insane routine, whether it’s stretching the same way during the same points of every game, sipping water the same number of times every time, even tapping the goal posts in some creepy order during every break. Maybe facing 35-40 shots a game with forwards repeatedly crashing the net like semitrucks drives you toward the sanctity of those OCD routines. Maybe they’re bonkers to begin with. Regardless, it’s a fragile position played by seemingly fragile people. People who can’t allow themselves to rest for a second. Well, except for Tim Thomas. Of all the goalies I caught in person this season, he was the only one who didn’t seem flummoxed by the pressure. If anything, he carried himself more like a professional golfer. He barely did any of the OCD stuff, just some easy stretching to stay loose. He conversed with linesmen during breaks and seemed to be genuinely amused by the Ice Girls. Sometimes when he pulled off his mask to grab a drink, he’d stare into our section and check out the fans (with a friendly look on his face, no less). One time, he did something that I never saw any other goalie do — as players fought for the puck on the other end, Thomas rested his right arm on the crossbar and leaned against his own net. For a few seconds, he just hung out and watched the game with us — happily playing the role of “The Guy Who Won Last Year’s Cup and Fully Expects to Win Again.” The champs were in the house. And acting like it. Looking back, that moment summed up the season. The Bruins were good and they knew it. They fully expected things to work out their way; that’s what happened last year, that’s what would happen this year. Of course, the Hockey Gods had other ideas. There’s a reason no NHL champ has repeated since the ’98 Red Wings; it’s hard to be good AND lucky for two straight years. As last night proved, a second straight Cup just wasn’t meant to be. My friend Sean Grande summed it up best: “That was a great title defense for the Bruins. They wore the belt well.” And they did. 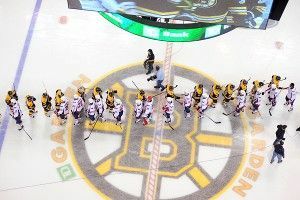 Last note: After the game abruptly ended, a few idiot Bruins fans tweeted racial slurs because Ward (an African-Canadian) scored the game-winning goal. Those morons don’t reflect on the city of Boston, but rather the Internet itself — an occasionally unseemly place with little accountability that willingly courts hateful morons from every corner of the world. Over the years, I have gotten e-mails from “readers” hoping that I’d die in a fire and (fill in any other horrible scenario). I don’t even blink when I see that stuff anymore. It’s just part of life on the Internet. If you don’t believe me, spend an hour reading YouTube comments some time. Just because last night became Boston’s spin on the Hateful Idiot Internet Wheel doesn’t mean some larger connection needs to be made, even if it may have fit neatly into a once-popular (and increasingly unfair) stereotype of Boston that stopped being true long ago. It’s not 1974 any more. Those assholes didn’t represent Boston, but rather the underbelly of the Internet itself. There’s a difference.